Kyoto is, in my opinion, the vegan capital of Asia: it has over a dozen vegan restaurants, and unlike Tokyo most are within walking distance of the common visitor attractions, and their standards and variety on average exceed Taipei. With a little planning, or even without it, it would be possible to eat at different restaurants for lunch and dinner for several days. And while shojin ryori (Buddhist temple cuisine) is a must-eat at least once in Japan - and Kyoto the place to do it - many are surprisingly inexpensive, with a simple set meal often costing as little as a thousand yen, much less than a comparable meal would be in most of the world's historic or major cities. If I had to choose one city to be confined to for the rest of my life, it would be Kyoto. It should feature on any Japan travel itinerary, or if coming from Asia, the Kansai region makes a worthwhile travel destination in itself. Most sites of interest, and hotels, are north of Kyoto Station, except for Vegans Cafe & Restaurant and Inari Fushima Shrine to the south. Higashiyama has the greatest density of key sites, including most famous temples and the Walk of Philosophy to to Kinkakuji (Silver Pavilion), which has three veg'n restaurants nearby. Gion is the ancient heart of Kyoto, and a must-visit, preferably during the evening; nearby are Cafe Matsuontoko, Choice Cafe Restaurant and Tamisa Cafe / Yoga studio. Morpho Cafe lies slightly to the North East, making it a good stop on the way to / from Kinkakuji (Golden Pavilion) while the Veggie Cafe lies to the West, making it a good stop for Arashiyama, were most of the temples and upmarket restaurants serving shojin ryori are located. Kyoto is a great city for walking. While the big-ticket temples in Higashiyama and Kinkakuji should be on every visitor's list, I find that the less-famous temples are often much more memorable, both large temples with friendly resident monks (as opposed to ticket salespeople found at the gates of the famous temples) or tiny roadside temples or shrines. In particular I always enjoy walking to or from Kinkakuji, perhaps stopping at Morpho Cafe (or the Veggie Cafe) along the way but otherwise just following any path which seems interesting at the time. While expensive, if possible I recommend trying shojin ryori (Buddhist temple cuisine) at least once in Japan, preferably in Kyoto. This cuisine has been developed over centuries (after Buddhism was imported from China) and is vegan without onion or garlic, but it never hurts to check! A feast at Kanga An includes several meals like these ones. My favourite Shojin restaurant in Kyoto (and all of Japan) is Kanga An, the 'real deal', located inside a temple. It's not cheap, with even basic meals (once taxes and a drink are included) not leaving much change out of 10,000 Yen, but it's an experience you'll remember well after you've forgotten all the temples and train rides. As food is bought, prepared and served especially for the small number of customers at any time, it's necessary to arrange a meal at least three days in advance, and to honour the arrangement. Besides Kanga An, most Shojin Ryori restaurants are in Arashiyama, famous for the Bamboo Grove. I enjoyed it at Tenryuji Shigetsu (Happycow), which offers an excellent lunch deal at a comparatively low price of 3500 Yen (including entrance to the Tenryuji Temple) but it's also available at plenty of other places, with prices going up to and beyond 10,000 Yen, or more for dinner. Most shojin ryori restaurants are located in Arashiyama in Western Kyoto. Arashiyama is a beautiful suburb which is much less crowded that Higashiyama. It doesn't have the same density of temples or historic quarters as Higashiyama, but is at least as beautiful. If you spend the afternoon in Arashiyama but only wish to eat shojin ryori once consider a meal at the Veggie Cafe on your way there or back, and note that shojin ryori is significantly cheaper for lunch. Unfortunately the high price of shojin ryori makes it prone to abuse, and there are many 'fake' shojin ryori restaurants (mostly outside of Kyoto) which serve similar food but not with nearly the same quality ingredients or careful preparation; while a foreign tourist may not notice a significant difference it would be a waste of this quintessential Japanese vegan experience (and a lot of money) to try an imitation. It's best to eat at restaurants in or directly attached to temples, also always read reviews first, and NEVER eat "shojin ryori" from a restaurant which also serves non-vegetarian food: it's fake shojin ryori and may well contain fish derivatives. Staying at a temple at Koyasan is a great way to experience a temple and try shojin ryori. At 10,000 Yen it's much more economic than dining in Kyoto (Eko In). Temples at Koyasan (Mt Koya) offer excellent deals combining shojin ryori for breakfast and dinner with accommodation (starting at around 10 000 Yen), a good overnight trip from Kyoto or Osaka. Shojin ryori is considered to be food in a class of its own, and is certainly priced so. But Vegans Cafe and Restaurant (Happycow), in my opinion, gives the temples (and private restaurants) a run for their Yen. Being vegan is about all they share, however, with shojin ryori being strictly traditional Buddhist temple food while Vegans serves up modern, delicious fusion cuisine with particular emphasis on classic western comfort foods, including the best pizza in Kyoto, making it especially popular with foreign tourists. It also appears to have become the default centre of the animal rights community in Kyoto. I think that what gives Vegans Cafe and Restaurant its edge is that it's run a couple who are both passionate about veganism and experienced in the food industry; they ran a successful Yakinuki (fried meat) business for years before closing it to open Vegans Cafe and Restaurant after learning about animal cruelty online. This gives the restaurant a vibe which the majority of macrobiotic cafes in Japan (including some in Kyoto) just don't have when they're run by someone perhaps vaguely interested in the health aspects of macrobiotic food (which often comes after a period of ill-health) or who simply sees a business opportunity in it. Where Vegans Cafe and Restaurant falls short is its venue: it's essentially on the 'wrong' (south) side of Kyoto Station, while most attractions and accommodation are to the north. And the venue itself is little more than a tastefully converted garage. But don't let that put you off: a visit to Vegans is a must while in Kyoto, and I recommend it for early in your stay to allow time for a possible return visit. It's only a five-minute ride on the JR Nara Line (to Inari Station) and a one-kilometre walk or short taxi ride, so can easily be managed after a long day exploring Kyoto. It's even easier of coming from Gion (a common end to a day exploring Higashiyama) requiring only a twenty-minute journey via the Keihan Main Line, including only a 600-metre walk. Vegans Cafe and Restaurant isn't completely off the tourist path. Be sure to visit Fushimi Inari Shrine, which is famous for its path up Mount Inari through thousands of orange torii (gates). This is one of few famous Shinto shrines in Kyoto (the large, famous temples are mostly Buddhist) and being the goddess or god of rice and sake, s/he's obviously important to Japan! (She manifests as both genders!) The beautiful trails around the mountain to the thousands of sub-shrines are difficult (and dangerous) at night, so a good option would be to have a late lunch at Vegans, explore Mt Inari during the afternoon and early evening, and then either return to Vegans for dinner or head back to northern Kyoto. Vegan Heaven serves the finest non-Shojin Ryori meal in Kyoto. Details to come soon. This central area is close to Gion, and has several restaurants which don't work in perfectly with any itinerary but can easily be reached before or after a day's exploring. It's a little out of the way, but well worth the effort. If you won't be digging deep for shojin ryori in Arashiyama then the Veggie Cafe makes a good stop on the way there (or back, or both).Call first to check it's open. The owner of this charming little cafe is very passionate about healthy, organic food, particularly the use of agrochemicals in food, and he introduced me to the Fukuoka Method of Natural Farming, a system far better for the environment and its flora and fauna than organic farming. He returned to Japan from the USA to open the Veggie Cafe, which originally applied macrobiotic principles to Middle Eastern foods, particularly falafel, as he wanted to apply a familiar healthy food concept to something different to the regular curries and fake meat served at macrobiotic restaurants all over Japan. His menu now extends well beyond its falafel-and-hummus beginnings to include a range of soups, burgers and mexican dishes. During my visit he was experimenting with vegan baking using organic, whole grains. For many "organic" restaurants in Japan (and Taiwan, and probably most countries) the namesake food standard is little more than an aspiration to use organic foods "where possible", which generally means "when not much more expensive" which generally means that very little of the food is actually organic. At the Veggie Cafe the owner lists the ingredients of his entire menu, stating which are organic, and virtually all are (eg "organic flour, yeast, organic sultanas...". I think the food at the Veggie Cafe is among the healthiest and certainly the best value in Kyoto, which is especially rare for a restaurant which uses mostly organic food. These delicious pancakes were made from organic, whole grains. Morpho Cafe is, in my opinion, one of Kyoto's top inexpensive vegan cafes / restaurants. 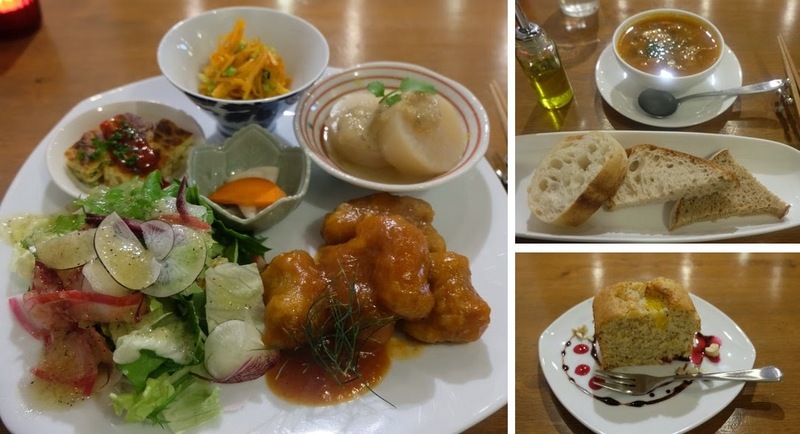 The food is not quite as good as amazing as Vegans Cafe and Restaurant, or as inexpensive as Sujata or Veggie Cafe, but if you're looking for a delicious, fairly inexpensive meal, in central Kyoto, Morpho Cafe is a good option. It's not far from Gion. The staff are friendly and welcoming, and those I spoke with were clearly knowledgeable and passionate about healthy food. This new curry noodle dish is an impressive and certainly unusual fusion of Thai and Japanese tastes. I was told to add the rice after finishing the noodles, which worked well. Morpho Cafe serves a fairly typical mix of western, Japanese and a good range of fusion foods, including an authentic green curry and some great desserts. Main dishes start at around 1,000 Yen, and drinks and desserts are reasonably priced. This health-focussed cafe serves typical macrobiotic food found all over Japan, somewhat westernised for the stream of tourists continually passing through its doors on their way to or from Higashiyama. It has a spacious, impeccably-clean interior, and also sells a few alternative health and body care products. Set meals cost around a thousand Yen, with about half as much again for drinks or dessert. It's a very enjoyable spot for a meal when in the Gion area but nothing particularly stands out about the food or the restaurant to make it to your 'must-visit' list. A Place to Chill Out or Work? Order a coffee and get some work done, using the free wifi. There are also plenty of individual tables in the large restaurant. Need somewhere to write your Happycow reviews? Being a large restaurant with a range of table arrangements, they're unlikely to be full, so while I'd recommend not staying longer than it takes to eat your meal if customers are waiting for tables, they advertise themselves as an "eat and study space" and offer free wifi, so if you need to hang out or get some work done, Cafe Choice makes a good alternative to Starbucks. Restaurants like this generally expect customers to order a drink if staying a long time, even after eating a meal. This quiche set was excellent value at about 1,000 Yen. Tamisa Organic Cafe is a small cafe attached to a Yoga Studio and alternative health / culture shop. With only three small tables the cafe appears to be very much a side business mostly serving the steady stream of yoga clientelle, but walk-in customers are also welcome. Basic lunch sets start at around 1,000 Yen, and it had a very peaceful, relaxing vibe. It needn't make your 'must visit' list, but it's one of the better simple lunch sets in this price range, and definitely worth stopping in for a meal and drink if in the area. It doesn't specify how much of the food is organic. 11:30 - 17:00 (L.O. 14:30) daily, with variable holidays. Call to check if open first. Kyoto's phantom vegan cafe is one of Kyoto's first, but it's also one of the hardest to find open; I have a record of once in about a dozen attemps. If you are in the area (around Demachiyanagai Station, perhaps on your way back from Ginkakuji after a visit to Higashiyama I recommend stopping by in case it's open; if not (and it probably will be not) then go on to Padma, or else take the subway anywhere else in the area. Closed Tuesday or possibly other times - call ahead first. Higashiyama is the quintessential Kyoto experience, but you'll be enjoying it with thousands of domestic and international tourists, especially during weekends and public holidays. The usual route is to start in Southern Higashiyama and work northwards, eventually walking the Path of Philosophy to Ginkakuji. Unfortunately there are no vegetarian restaurants in Southern Higashiyama, so it's important to eat well in the morning before setting off. This day's exploring can be finished with a meal at Sujata or Tosca, which are both a short walk from Ginkakuji. The owner of Cacao Magic, 'went raw' in the USA, and felt so much better for it that she decided to share the diet and lifestyle in her home country of Japan. She originally opened a raw food restaurant at the same location, but went on to find a niche in raw (vegan) chocolate as a more effective way to introduce the benefits of raw food through something everyone loves. Cacao Magic is something of a cottage industry, churning out raw, vegan chocolate for sale in the shop and online, however they may sell through larger retailers in future. During my visit the attached cafe was closed to allow the space to be used for the production and distribution of the chocolates, as I understand is often the case, however boxed chocolates are always available for purchase. Chocolates cost around 500 Yen and up (per chocolate) and come in sets, starting with around four chocolates, but it's important to remember that these are 100 per cent vegan and raw, and made freshly on the premises. If you're looking for the cafe it's worth dropping in as it's a few minutes walk from Kinkakuji. Opening days vary - call ahead or drop in if visiting Ginkakuji. Tosca is run by two sisters whose parents have been vegan for decades, at a time when even vegetarianism would have been unheard of in Japan (outside of its very limited following among Buddhist monks from certain sects). It serves typical western / fusion food in a warm, spacious dining atmosphere. If you want to 'go out for a nice meal' but enjoy more familiar food in a more familiar setting than the shojin ryori experience (and spend much less) then Tosca is the place to come. At just under 2500 Yen Tosca's dinner sets are great value. While it's in the upper price bracket, their dinner sets, which start at around 2500 Yen, and are excellent value for such fine food in a classy restaurant. It's located a short walk from Sujata, slightly closer to Ginkakuji. Like Sujata, it's a nice culmination of a day walking from Southern to Northern Higashiyama, finishing at Kinkakuji. Sujata (Happycow) is one of my favourite restaurants in Japan. This charming, humble eatery is run by a delightful Japanese lady who is a devout disciple of Sri Chimnoy (1931 - 2007), an Indian guru who taught his disciples to meditate and encouraged them to open vegetarian restaurants around the world. Food is vegan by default, with the occasional optional non-vegan addition (such as an egg to Japanese dishes). While she has occasional helpers, Sujata manages virtually the entire running of this busy restaurant herself, serving up a delicious Indian and Japanese favourites, including some very authentic Indian dishes, making it the best Indian food in Kyoto. Sujata also offers free meditation classes at 6:00PM on Saturdays. I don't often recommend individual dishes, but Sujata's home-style samosas, which she makes from scratch, remind me of my Indian friend's mother's cooking when I was a young child, and are a world apart from the oily, soggy equivalents served at most Indian restaurants around the world, especially Japan. I was especially grateful to Sujata for staying open during the New Year period, when it was otherwise almost impossible to find vegan food, even in Kyoto. She does, however, close for a period further into the year (in January in 2015) so if you find her closed I recommended walking to Tosca [link], and not the nearby Indian restaurants, as neither would honestly entertain the idea of providing trustworthy vegan food when I tried. Not just Indian: This traditional Japanese New Years Eve dish was delicious. If you'll be in Kyoto for a while and are looking for a simple, inexpensive place for healthy, satisfying vegan food then Sujata is one of the best places in Kyoto (The other is the Veggie Cafe. Sunny Place (Happycow) is also very good if you can find it open.) Many of her regular customers are students from nearby Kyoto University. Hours are irregular, call ahead first if coming from afar, or else just try Tosca up the road. Falafel Garden used to be a great vegan option for something different in Kyoto, and is still on Happycow. I had reasonable meals here in the past, but it's now trumped by the all-vegan, organic Veggie Cafe, to which it can't compare by any measure. There are several Indian restaurants in Kyoto, probably cashing in on a continual stream of foreign visitors wanting a break from Japanese food. I tested the waters at several, but was unable to find an owner/waiter/chef I trusted to provide trustworthy vegan food. For Indian food in Kyoto head to Sujata, or wait until Tokyo or your next destination. Kinkakuji (Golden Pavilion) is perhaps Kyoto's most famous landmark, but has no notable vegan restaurants nearby. A good option is to go to Morpho Cafe and take bus 12, or alternatively it makes a great walk back to central Kyoto. Oh God, this blog has saved me \o/ I can't thank you enough! 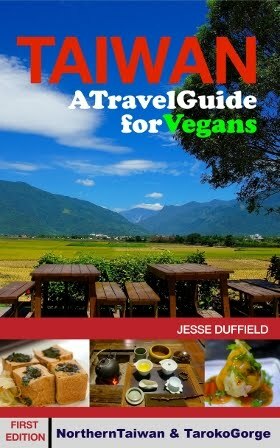 I'm travelling to Japan on July and I was deeply concerned about finding vegan restaurants / meals in Japan. I'm relieved to know I won't need to feed on deep fried potatos during the whole trip! Thank you Michele! I'm happy if I could help. I should say that in much of Japan being vegan is still difficult, but it's getting easier, especially in Tokyo and Kyoto. I'm living back in Taiwan now, but feel free to email me if I can help with anything. Otherwise have a good, safe trip! It's an amazing country! Great article with a lot information. Thank you so much. I am heading to Kyoto this weekend, and I will definitely go to these vegan places for my meal. Remember last time I went to Kyoto, the only vegan place I can find is Cafe Proverbs. Glad there are so many options now.